Could a doll be the link to the missing sister? Wowsers!! What a fabulous read. I picked this book up purely because it was facing me on the library bookshelf and I needed something new to read. I was not disappointed!! This book magically weaves family generational dynamics with a whole pot of mystery and intrigue. Also add a dash of creepy dolls into the mix and you have a recipe for a book you cannot stop reading!!!! This book follows three generations of a family. From the mother, who has spent her life making dolls, to her daughter, whose sister disappeared when she was young, to the granddaughter who becomes caught up in solving the mystery of Janey’s disappearance. It shows how the traumatic event of Janey disappearing has had a long lasting effect on the families lives, as well as those around them. This book incorporates a number of twists and turns, revealing more and more of the characters’ true selves as the story unfolds. I enjoyed the many facets of this story, as well as the developments of the characters. I appreciated how unique each character was and what they brought to the story. I was also intrigued with how the characters changed throughout the story recognising what is important to them and the ones they love. This book was an easy and interesting read. I believe the author touched on some creepy aspects – which could have been explored further. Nevertheless, this novel makes for an interesting mystery with a few unexpected twists. I give it a rating of four stars (probably closer to 4 ½). Share the post "Could a doll be the link to the missing sister?" You have redeemed yourself Janet. Get the tissues ready for this one! 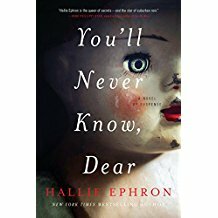 Okay, the creepy cover alone is intriguing me… so I’ll definitely have to throw this onto my To Read list now after your review!